How much value do you put into the sound of your motorcycle, then? On most big bikes, in fact, the aftermarket exhaust is where customisation begins. And to me, the first thing you will notice about the Honda CB650F is the intake noise. The ever-present muted, refined but audible roar elevates the riding experience from the more indifferent feel of its faired cousin, the Honda CBR650F. The extra leverage from the handlebar and the more upright riding position also contribute to the feel and the Honda CB650F felt like a much happier, more enthusiastic motorcycle than the CBR650F. It also feels skinnier, as nakeds tend to, and more manageable in traffic which, again, adds to the list of reasons to add it to the Indian Honda portfolio. Because these feel elements apart, it's a competent Honda middleweight. The brakes are just sharp enough, the new LED head light works well, the styling is attractive in that non-specific Honda way and the engine's refinement levels are very high too apart from a buzz at 100-110kmph in the bars. Honda really should expand the middleweight range with this. 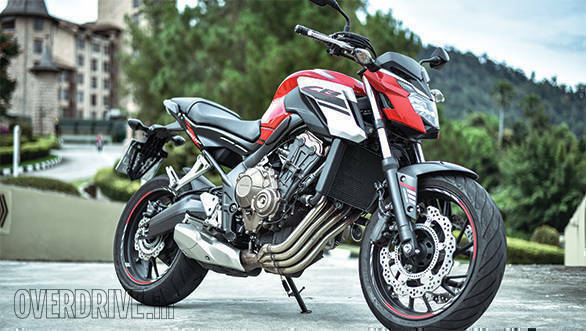 Indian riders might be fairing-fans for the moment, but I believe the CB650F will be less expensive by a small margin and in the longer run, its riders will spread its sweetly whispered words around too.